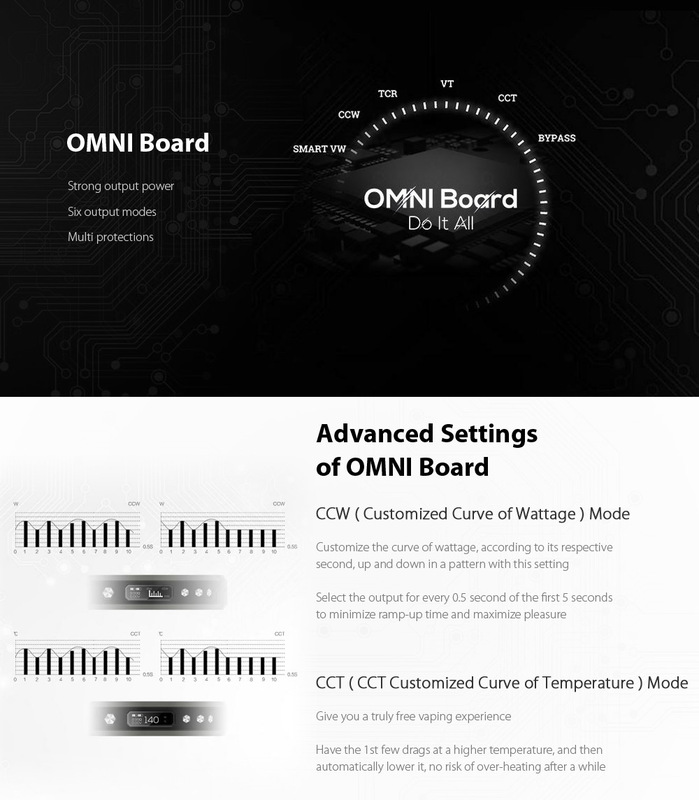 In the updated OMNI board 4.0 covering newly added full temperature control and Insta-fire function - the highest firing speed of 0.001s! PCBA Water resistant, 2.5A quick charge, multi protection and further optimization designed for the GT meshed coil, all help to produce a more flavorful yet more safe vaping experience for you. As an advanced Variable Wattage mode, there are 3 levels: VW-H(High); VW-N (Normal); VW-S( Soft). The default setting is Normal. In VW mode, the device will automatically adjust the voltage to support the wattage you selected. If you want to switch between different ohms resistance, you don’t need to change your wattage setting, your mod will automatically select the adequate average wattage for your atomizer. To customize you own curve of wattage line using the plus and minus buttons (Ramp-up time and consequent performance); move on to the next bar with a quick press of the fire button When all modifications are done just press the mode button to save and exit. In SP mode, it has broader resistance range from 0.03Ω-5Ω which is adaptive to mainstream RDA tanks. Variable Voltage works by adjusting the voltage up or down to match the perfect heat level. You will have to change different voltage since different tanks have different resistances. If you are using the tank with higher resistance, you just need to increase your voltage. Vice Versa. When device is in VT-NI/ TI/ SS mode(Auto Function enabled), the device can separately support Nickel 200, Titanium, and 316 Stainless Steel coils smartly . In this mode, it will intelligently adjust temperature control parameters based on the heating wire material's resistance value, also it allows you to change the startup wattage. You can choose your own Manual setting and set the TCR at different values within proper range. Direct output voltage system is applied in Bypass mode. The higher the battery level is, the higher the output voltage is. When set in this mode, the device can support a coil whose resistance is within the range of 0.05-5ohm. As an advanced Variable Wattage mode, when you turn on the smart function, it can change intensity according to the coils resistance levels within a safe limit in VW-H/N/S mode. The Auto function taking away any operation difficulties switching between VW-H and VW-N or between VT-H and VT-N.
To achieve better temperature control effect, the mod will ask the user if the new atomizer is attached. " OLD LOAD: -, NEW LOAD: + " will appear on the display. If a new atomizer is attached, press " + ", the mod will read new resistance; if not, press " - ", the mod will read at locked resistance.